BEIJING, Sept. 2,Chinese President Xi Jinping on Sunday met with United Nations (UN) Secretary-General Antonio Guterres ahead of the 2018 Beijing Summit of the Forum on China-Africa Cooperation (FOCAC), scheduled for Sept. 3 and 4. Calling the UN "the flag of multilateralism," Xi said the world has been more in need than ever of multilateralism and a stronger UN as the rising unilateralism and protectionism is dealing a blow to the international order and the system of global governance. The most fundamental principle of multilateralism is to address international issues through consultation in accordance with the collectively agreed rules, with each country's interests and concerns taken into consideration, Xi said. Noting that China has always firmly supported multilateralism and safeguarded the UN's authority and function, Xi said China expects the UN to play its leading role in upholding fairness and justice, safeguarding world peace and promoting common development, especially in deepening global cooperation and in tackling challenges facing the world. China's resolve in comprehensively deepening reform is unchanged. The country is ready to take concrete actions to unite with all parties to uphold liberalization and facilitation of trade and build an open world economy, Xi said. Noting China's long-time friendship and shared destiny with Africa, Xi said China does not attach any political strings, nor does it seek any privilege or special interest in China-Africa cooperation. "We will make unremitting efforts and do a good job as long as we believe it benefits African countries and people," Xi said. He called on the UN to take Africa as a priority in its work and support African countries in solving their problems in African ways so as to achieve long-term peace and stability on the continent. The UN should help African countries speed up development, support their unity, self-improvement and integration, and make their voice and influence greater in international affairs, Xi said. China is willing to strengthen communication and discussion with the UN on how to better support Africa, Xi said. 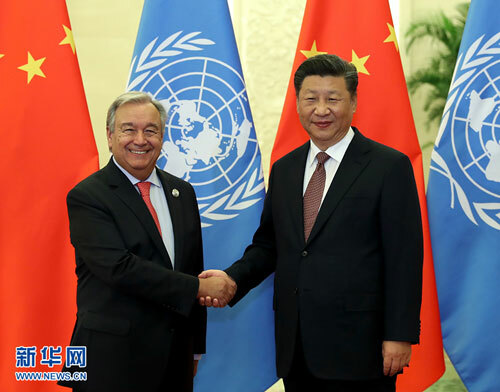 Guterres said African affairs have always been a priority on the UN agenda and his attendance to the Beijing summit is evidence of the UN's support of Africa and China-Africa cooperation. As a model of South-South cooperation, the FOCAC will make important contributions to world peace and development with demonstrative significance, he said, wishing a complete success of the summit. He praised China for its commitment to supporting multilateralism, actively safeguarding the multilateral order and improving global governance when multilateralism is facing severe challenges. China's development, a trend that cannot be halted, is of great significance to the cause of world peace and development, he said. The UN is willing to strengthen dialogue and cooperation with China to build a rule-based multi-polar world and encourage other countries to participate in the Belt and Road construction, he said. Guterres also expressed his gratitude for China's great efforts in tackling global challenges including climate change despite difficulties. 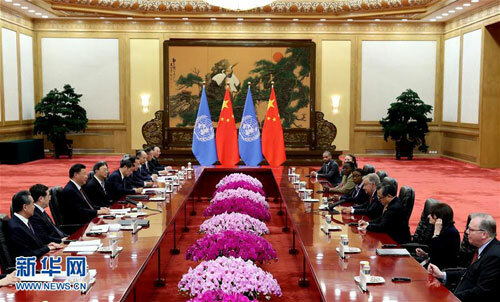 The UN expects more support from China on global governance and regional hotspot issues, he said.